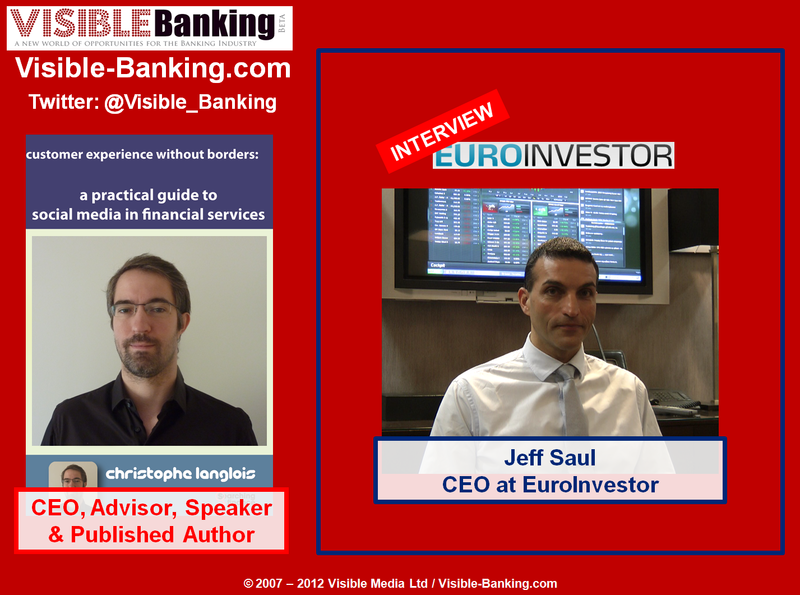 Last month, the day after Finovate Europe 2012, I had the opportunity to spend a couple of hours with Jeff Saul, the CEO of EuroInvestor.com. I recorded a video interview with Jeff who shared his vision on digital innovation, copy trading, forex online communities and demoed their new fully customizable and sharable dashboard ‘cockpit’. Wealth and Investments are two of the areas in financial services with the biggest potential in regards to social media. The advisors and brokers need to have access to the right, most relevant, information in close to real time. Private investors are becoming more and more savvy and their expectations have changed dramatically in the era of mainstream social media. They are better informed and they are looking for tools and services providing them with more control on their portfolio. In the last three years, we’ve noticed a large number of new startups and other online communities focused on investments, trading, and specific areas like forex. I invite you to watch my video interviews with the CEOs of etoro.com and nutmeg. Launched back in 1997, EuroInvestor.com is one of the pioneers of the digital space. Since Jeff officially joined the company at its help during the summer 2011, he’s been focused on finding new ways to take the company’s digital presence to the next level. His team undertook a massive SEO project, and they have recently launched a brand new, fully customizable and sharable, Equity user interface ‘Cockpit‘. I invite you to watch my video with Jeff where we had a discussion on topics such as social media, digital innovation and copy trading. If you are curious to see how Cockpit looks like, please check the short demonstration provided by Jeff himself. Jeff is based in Denmark, but he flies to London on regular basis. You will have a chance to interview him and see him talk you through the user interface of their cockipt dashboard on March 28th and 29th. You will find out more about this event HERE. If you are interested, I invite you to send me an email directly asap: christophe.langlois@visible-banking.com.